While the basic mechanics of climate change are well understood, uncertainties associated with future greenhouse gas emission rates and various climate system feedbacks make it difficult to know the exact rate and extent of warming. Understanding both the degree and the sources of uncertainty is key to effective decision making and, in this bulletin, we will identify aspects of the science that are well established and active areas of research. Part 1 of this bulletin covers certainty and uncertainty associated with the climate system. Next month, Part 2 will cover certainty and uncertainty associated with forest response to climate change. Even as we identify areas of uncertainty, we recognize that there are situations in which a hazard is not absolutely certain but still poses a risk – the primary reason why we might be interested in flood or fire insurance, for example. Ultimately, all decision-makers, including forest managers, want to understand what is known and unknown, minimize uncertainty wherever possible, and choose the best strategy (based on individual risk tolerance) for dealing with it. Accounting for the influence of the sun is fairly straightforward because solar activity follows predictable cycles. Also, changes in solar output are modest compared to these other factors (e.g. the difference between the minimum and maximum of a solar cycle is only 7% as much energy as the amount of additional energy from all human greenhouse gas emissions since pre-industrial times). The major areas of uncertainty about future climate change are related to the last two items – these variables are affected by feedbacks in the climate system and the last is related to the amount of future emissions. There is uncertainty in our estimates of future global greenhouse gas emissions (hence why researchers typically utilize different emissions ‘scenarios’) because it will depend on how much the world population grows, the nature of future economic development, and the technology we use to meet our energy demands. As of now, global emissions are tracking the highest emissions scenario developed by the Intergovernmental Panel on Climate Change. Long-lived greenhouse gases, like CO2, are of particular concern because they will stay in the atmosphere for centuries and continue to affect the climate long after we reduce or eliminate human emissions. This long residence time allows concentrations to build and the science has shown that “climate change results from the cumulative buildup of GHGs [greenhouse gases] in the atmosphere over time, not emissions in any particular year” (Baumert et al 2005), highlighting the significant long-term influence of rising greenhouse gas levels. 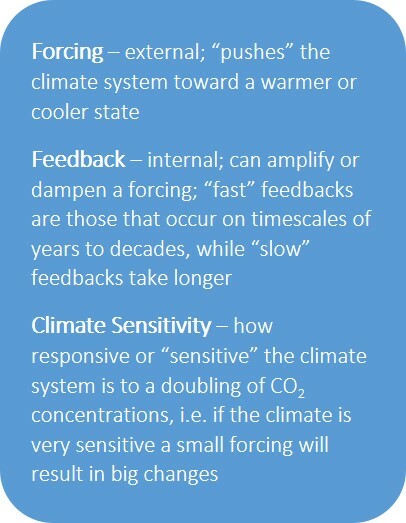 There are a number of positive and negative feedbacks in the climate system, which amplify or reduce the effect of a given climate forcing. Climate models include these processes, but each model may have slight differences in the relative magnitude of individual feedbacks. This is why there is some uncertainty about the exact amount of warming we will experience from a particular concentration of greenhouse gases. This question of climate sensitivity has been a central area of research for decades and, as cited in a previous bulletin, the best current estimates suggest that doubling atmospheric CO2 concentrations (to about 550 ppm) will ultimately result in 2.7 to 8.1⁰F of global average warming. We will likely reach those concentrations by the middle of this century, if we continue on the current global emissions trajectory. Forty years of research from independent lines of evidence, including computer models and the study of past climate change, have given us confidence that the answer lies within this range. Although, this range is really a bell curve of possibility (not all values are equally likely) and research has not been able to narrow that range. Feedbacks also play out on different timescales – from some that occur over the course of several years (e.g. changes in snow/ice cover) to others that take place over millennia (e.g. changes in the carbon cycle or the mass of ice-sheets on land), and beyond. There is a lot of inertia in the earth’s climate system and this is also why past emissions have already committed us to a certain amount of warming. Warmer temperatures melt bright snow/ice cover, revealing darker land and ocean water surfaces that absorb more solar radiation, which increases local warming that leads to more snow/ice melt, and so on. A warmer atmosphere can hold more water vapor, which traps more heat, which allows the atmosphere to become even more saturated, which warms things further, and so on. Likewise, cooling causes water vapor to condense and rain out, which reduces temperature, leading to further precipitation, and so on. Water vapor is a very potent greenhouse gas, but it does not contribute significantly to the long-term greenhouse effect because its typical residence time in the atmosphere is only about ten days, unlike CO2 which stays in the atmosphere for centuries. We spend a lot of time considering how the climate affects forests, but it is not a one-way relationship – forests also interact with the atmosphere and contribute to climate feedbacks. Forests affect the amount of energy absorbed and reflected from the surface (dark forest canopy has lower albedo), the hydrologic cycle (through evapotranspiration), and the carbon cycle (through photosynthesis and carbon sequestration). Through these processes, forests can act as both a negative and positive feedback, and the magnitude of these effects varies depending on forest type (see table below) (Bonan 2008). Another important area of uncertainty is related to so-called ‘tipping points’ in the climate system – these are points “beyond which an abrupt or irreversible transition to a different climatic state occurs” (Walsh et al 2014). Tipping points, such as the runaway loss of arctic sea ice, the collapse of some ocean circulation patterns, or large-scale release of carbon from melting permafrost, involve (practically) irreversible impacts that occur when a process crosses a threshold, kicking off feedbacks that will continue to push the climate in one direction, even if we reduce emissions. There is evidence that these types of tipping points have been reached repeatedly in the past. The challenge is that they are much more difficult to predict than gradual climate changes and they are hard to detect until you’ve already passed them. Despite this uncertainty, the potential for this kind of abrupt change is a big concern because it will be high impact and have major consequences for both human societies and natural systems. Additional uncertainty comes not from imperfect understanding or modelling of the large-scale climate system, but from the challenge of “downscaling” the results of global climate models. As mentioned in a previous bulletin, the resolution used to simulate global-scale processes does not match the scale of forest management and the use of either statistical or dynamical downscaling methods introduces a new layer of uncertainty in regional climate projections – an important caveat to keep in mind when viewing climate projections for your particular region. At the simplest level, climate change is about an imbalance in the earth’s energy budget – a stronger greenhouse effect is trapping more energy in the climate system and the planet is getting warmer to radiate an equal amount of energy back out. We know that the average global temperature will continue to increase because of this imbalance, but there is still some uncertainty in the details of exactly how these changes will play out, especially at a regional level. There are also a host of additional side-effects, such as changing precipitation, ecological shifts, changing extremes, and so on. 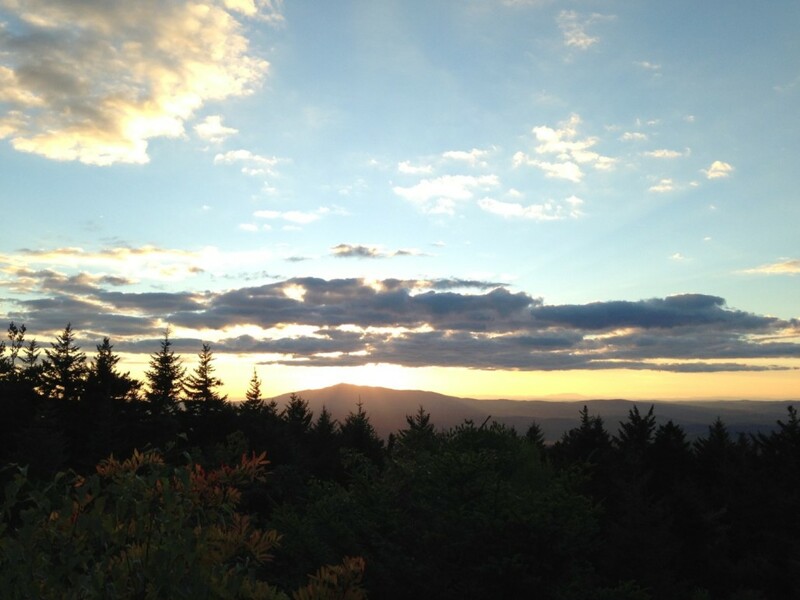 In next month’s bulletin, we will focus on the uncertainty related to forest impacts and discuss the range of strategies for coping with uncertainty in the realm of forest management. Baumert, Kevin A., Timothy Herzog, and Jonathan Pershing. 2005. “Chapter 6: Cumulative Emissions.” In Navigating the Numbers: Greenhouse Gas Data and International Climate Policy. World Resources Institute. Bonan, Gordon B. 2008. “Forests and Climate Change: Forcings, Feedbacks, and the Climate Benefits of Forests.” Science 320 (5882): 1444–49. doi:10.1126/science.1155121. Le Page, Michael. 2011. “What We Do Know – and What We Don’t.” NewScientist, October 22. “Making Sense of Palaeoclimate Sensitivity.” 2012. Nature 491 (7426): 683–91. doi:10.1038/nature11574. McGuffie, F., and A. Henderson-Sellers. 1997. “1.4 Climate Feedbacks and Sensitivity.” In: A Climate Modelling Primer, 2nd ed., 31–39. Chichester, West Sussex, England: John Wiley & Sons. Walsh, J., D. Wuebbles, K. Hayhoe, J. Kossin, K. Kunkel, G. Stephens, P. Thorne, R. Vose, M. Wehner, J. Willis, D. Anderson, V. Kharin, T. Knutson, F. Landerer, T. Lenton, J. Kennedy, and R. Somerville, 2014: Appendix 4: Frequently Asked Questions. Climate Change Impacts in the United States: The Third National Climate Assessment, J. M. Melillo, Terese (T.C.) Richmond, and G. W. Yohe, Eds., U.S. Global Change Research Program, 790-820. doi:10.7930/J0G15XS3.